Ski Betty's take note, the ultimate base layer is here. Crafted in quick-drying fabric, a high-neck, statement jacquard and contrast colour block panels guarantee statement style. As technical as it is beautiful, the high collar and ribbed cuffs and hem block out cold on and off the slopes. Ski Betty Seamless Long Sleeve Base Layer Top is rated 3.5 out of 5 by 27. Rated 4 out of 5 by Weatherwoman from You can't beat ski-lady houndstooth! Great base layer for skiing. Kept me warm and dry! 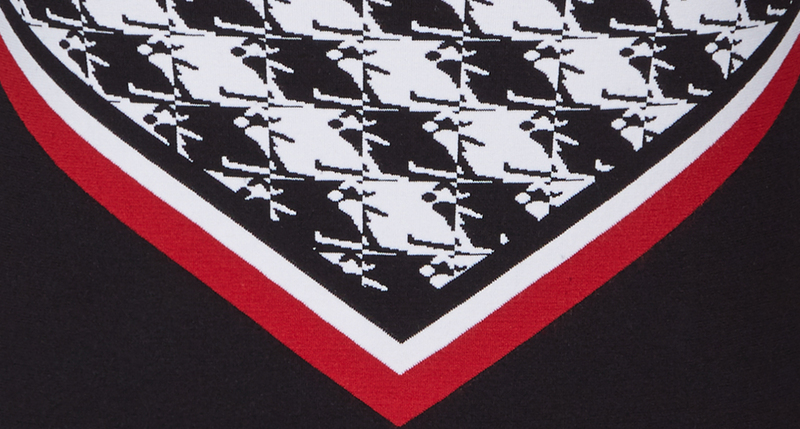 I must admit I bought this top solely for the fun of the houndstooth pattern. I love that it has skiing women in the pattern! So much fun. Rated 4 out of 5 by Weatherwoman from Such a fun top! A great base layer for skiing. The fabric did its wicking thing, and I stayed warm and dry all morning. As a bonus, I wore it biking in the afternoon, and it doubled well as a base layer under my cycling jacket, too! Rated 1 out of 5 by Skidiva from Terrible quality Wow, horrible quality. The inside has a bunch of strings and your fingers will get caught in the inside. The outside of the shirt is already worn as though I rubbed against Velcro...only I never have. It did look stylish and retro before it started falling apart. Glad I bought this on sale - I’d be really annoyed if I paid full price. Rated 5 out of 5 by GreenStarfish from Comfortable and the print looks great I love how well this print wears up close and far away. It's very comfortable and a great look to dress up or down. Care does need to be taken when putting it on or taking off if you're wearing jewelry, but that's the only downside. This is the second seasons I've bought this style/fabric - first season being 2 winters ago. I till have those tops and wear them often. They've laundered well. Rated 5 out of 5 by JeanK from How cool is this layering piece! And I don’t even ski. Looks great with black pants and under jackets.